Do you remember our painting fiasco from last week? Yeah, I thought you wouldn't forget that fast. I hadn't. Well, my mom immediately called after I posted it and offered some suggestions for how to get it up. I happened to have all the different things suggested on hand, so I gave them a go. Unfortunately, none really worked. I don't have the money to run out and buy a throw rug to lay over it, so the next best thing was re-arranging the furniture to cover it up for awhile. I haven't decided whether I like it or not yet. I've thought about doing it before, but didn't know what to do with the tv stand. I've re-arranged this room more than any other since moving into our house. It's hard to arrange a room that literally only has four feet of wall in it. I normally would never cover up a window that big, but we had a few more to spare. Plus, we're hardly ever in that part of the back yard and no one can see that part of our house, so I was no longer worried about seeing the back of a tv cabinet through a window. I think I should throw in the disclaimer that there is a valid reason I have different colored couches. 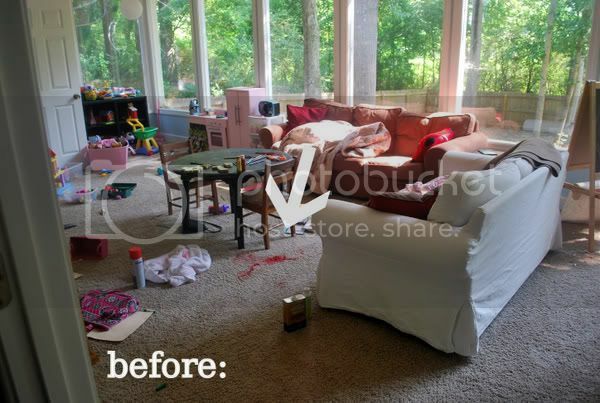 Last summer, I broke the set up and put the loveseat in our master bedroom. Last fall, I wanted to try my hand at dying the couch slipcover a dark brown. I wasn't impressed with it, but wasn't in a hurry to fix it. Last month, we were handed down another loveseat that we put in our bedroom, so the original one came back out to the playroom. Buying new slipcovers is the first thing on my list when I get back from vacation. Oh, and obviously I have a few painting projects that I haven't gotten around to in this room. Don't judge. I do like the fact, that it in a odd way, the setup makes this room seem a little more separate from the living room. Plus, even though the tv stand is in front of a window, you get a better view of the back yard and there is no longer a glare on the tv. 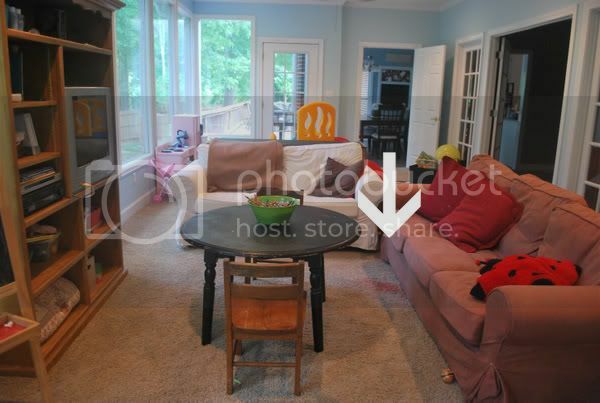 I'm not totally crazy with the space between the tv stand, kids table, and couches. There is not that much walking room, but it will work for now. 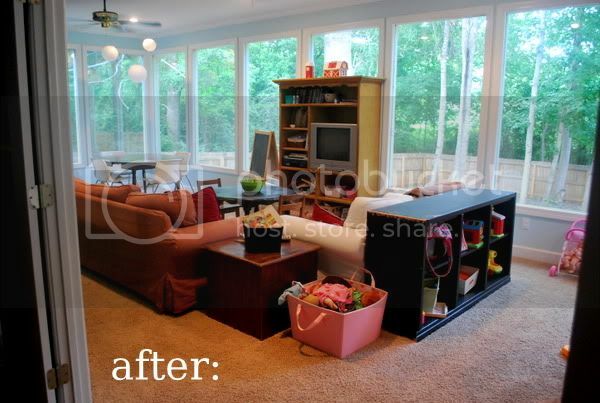 Oh, and the fact that the couch had to still be positioned to were it didn't totally cover up the spot. But, the spot is no longer glaring at me every time I walk by the room. Let's be honest, you know it was driving me insane!